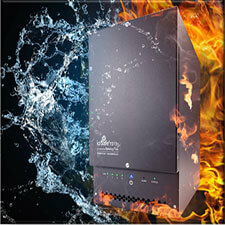 The ioSafe 214 is a fireproof and waterproof, network connected, multi-drive NAS/RAID storage device for terabytes of your precious or business data. Designed to be the center of your private cloud, the ioSafe 214 is powered by a Synology DSM motherboard and operating system. It allows for fast access on your local network and remote access from nearly any device connected to the internet – all secured and protected by you. The ioSafe 214 is designed and assembled by ioSafe in California – a data storage company with a vision to protect the world’s photos, videos and business data in the vulnerable private cloud.